Catalan President Carles Puigdemont say Catalonia no go accept Madrid plan to stop di region from standing on dia own. For one statement, im describe as Spain wan begin rule di region by dia own hand, as di worst attack on Catalonia since di Franco dictatorship. 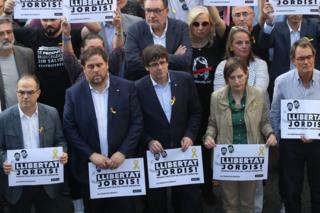 Spanish Prime Minister Mariano Rajoy plan include to remove di Catalan leaders, and control people wey dey make law. Dis one na because of di independence referendum wey happen for Catalonia, despite say Spain constitutional Court ban am. Hundreds of thousands of people don dey demonstrate for Barcelona as Spain wan begin rule di region from Madrid. Di people dey also ginger, say make Spain authorities release two people wey dey protest for independence wey dem arrest. Mr Puigdemont say di Spanish government dey act against di democratic mind of Catalans as dem no even wan follow dem talk. Im say im go call for meeting for di Catalan parliament so dat dem go debate how dem go take answer Mr Rajoy plans. Im talk to European citizens for English, come add say di values wey make European Union stand, dey for "risk for Catalonia." Catalonia Independence: Wetin dey next?